Fuel Injectors. Smart Car. 54 Plate. 0.7. Condition is Used. Dispatched with Royal Mail 2nd Class. Smart 451 CDI Diesel fuel rail complete with Manifold. P/N - MR988977. 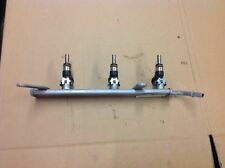 SMART FORFOUR 454 04-07 1.1 1.3 FUEL INJECTION RAIL WITH INJECTORS. MODEL FORFOUR. ENGINE 1.3 PETROL 95BHP 70KW. MAKE SMART. ITEM CONDITION. MILEAGE 78K. PAINT COLOR ORANGE. SMART FORFOUR 2004-2008 1.1 PETROL. LPG GAS INJECTOR RAIL 67R-010196 / 110R-000122. We cannot be held responsible if the item does not fit your vehicle. THIS DOES NOT INCLUDE NI, ROI, HIGHLANDS OR OFFSHORE ISLANDS. 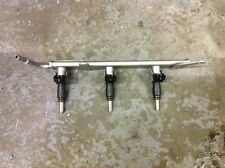 Item: Smart Forfour 454 / Mitsubishi Colt 2004-2006 Reg Petrol 3 Cylinder Fuel Injector Rail. Suitable vehicles: Smart Forfour 454 / Mitsubishi Colt 2004, 2005 & 2006 reg 3 Cylinder petrol models with an identical part currently fitted. 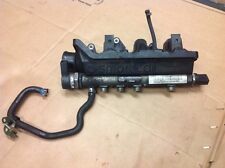 SMART FORFOUR W453 0.9 Fuel Rail 175209140R. Taken From The Model: Smart Fortwo Coupe 451 Petrol Automatic 2010. Apex Car Breakers Ltd.
Part number: MR988977. 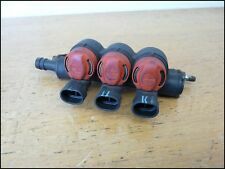 Item: Genuine Smart Forfour 2004-2006 reg 1.1 / 1.3 Petrol Fuel Injector. Suitable vehicles: Smart Forfour 454 2004, 2005 and 2006 reg 1.1 / 1.3 petrol models with an identical part currently fitted. SMART FORFOUR W453 0.9 Fuel Rail 100014697R 2810107600. Smart Car Fortwo W451 2007-2014. MHD - Stop/Start. Genuine Fuel / Petrol Injection Rail. 1.0 Petrol / 5 Speed Auto. SMART FORTWO W453 Fuel Rail 100015042R A2810103700. Type of vehicle Smart ForTwo 450 MC01 Cabrio 0.8 CDI. We ask however in case of short notice to prevent misunderstandings. Internal No. 83. Motor Diesel CDI 0,8L 30KW - Motorcode: 660.940. Step by step last step ---> a POSITIVE review! Karosserie Cabriolet. Le dépôt est Reto urn après la réception of the old part. 2000m., automatic, 30kw, 800cc, lhd. Smart ForTwo I 2000 Kraftstoffzufuhr zu Düsen Leitung (en) Diesel 30kW GPAC9654. Smart ForTwo I, other. Warranty on electronic devices is void if identifying mark is removed or has sign of tampering. 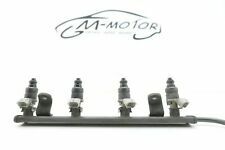 Smart Fortwo 451 injector fuel rail injector A1320780145. For over 15 years we are dealing exclusively with smart. In addition, you can buy also new and used cars from us. Thus it is not a production of inferior quality. A6600700095, 0445213003. Smart ForTwo I 2000 Kraftstoff-Stamm-Leitung A6600700095 Diesel 30kW GPAC9648. 2000m., automatic, 30kw, 800cc, lhd. Smart ForTwo I, other. Part Numbers The part is used. Not just a number. Injector Injector Nozzle for Smart 450 Fortwo 98-03 A6600700187 128TKM!!! without pressure sensor Fast shipping the same day if you pay by 2 pm All parts with functional warranty 30 days return policy on all parts without ifs and buts. MR988977 INJECTION TUBE with INJECTORS SERIES SMART FORFOUR < span class = notranslate ' > 1.1 B 5 p 5 m 47KW (2006) PARTS USED. Internal reference: 174/16MS. Part number 0003099V004. Smart ForTwo. Model Fortwo city Coupe 0.6. Modell Fortwo City-Coupe 0.6. City Coupe 0.6. All body parts are generally sold as original parts for painting. Spare parts always generally have to wear, therefore, is referred to this as needed! Fuel distributor smart 451 ForTwo CDI. - Soft touch circuit installation. - Transmission Service. - Air Conditioning Service. - Tire Service. Model - CITY-COUPE (450). Year - 2000. This is a quality tested, used spare part! Parts are fully functional but you should expect normal wear corresponding to the year and milage of the car the part has been removed from. Fuel distributor Smart ForTwo 451. - Soft touch circuit installation. - Transmission Service. - Air Conditioning Service. - Tire Service. High Pressure Line Fuel Line for Smart 450 Fortwo 98-03 128TKM!! High Pressure Line Fuel Line for Smart ForTwo 451 07-10 135TKM!!! High Pressure Line Fuel Line for Smart ForTwo 451 10-12 127TKM!! Smart ForTwo 450 injector injector 0003099V004 year 2002 H8. O riginal used spare parts for SMART FORTWO 0,6 l CONVERTIBLE MC01 pulse. Marke SMART. It is also possible to pick up. Matriculation year: 16.07.2002. (Used and fully functional. Visual condition see photos. Used auto parts in General not be cleaned by us, they are so photographed as they were built. Pictures say more than 1000 words :). 490413: A1600700195 2900900269 0003096V004 0280155814 0003099V004 Smart Smart Fuel injector rail (injectors)(Fuel distributor) 1999. 490413: A1600700195 2900900269 0003096V004 0280155814 0003099V004 Smart Smart Kuro magistrale 1999. Modellreihe Smart Fortwo. Suitable for all smart 451 and 0.8 liter engines (2007-2014). SMART ALPHA-VALVE. Fahrzeugmarke Smart. - Soft touch circuit installation. Also Pickup is possible! Warranty on parts installed by us: 1 year! 491085: 0261231133 a0041530928 0003120v002 Smart Smart Ignition Knock (Detonation) Sensor 1999. 491085: 0261231133 a0041530928 0003120v002 Smart Smart Detonacinis daviklis 1999. 491085: 0261231133 a0041530928 0003120v002 Smart Smart Klopfsensor 1999. Id453338: 0280155814 USED Smart Fortwo Kuro magistrale 2005. id453338: 0280155814 USED Smart Fortwo Einspritzleiste (Düsen) 2005. id453338: 0280155814 USED Smart Fortwo Топливная система (Магистральная трубка топлива) 2005. Years, engine2015m., 52kw, 1000cc. The carSmart ForTwo II. The item pictured is the one you will receive as-is and won't include any other parts or pieces. Warranty on electronic devices is void if identifying mark is removed or has sign of tampering. Smart Fortwo 450. -NOZZLE / NOZZLE / INJECTOR. Fits several SMART models. The part is 100% OK. 100% fine and is located in a very good used condition. We give a warranty for our products. Our products are used and may have therefore normal wear. Suitable for all smart 450 and 0.7 liter engines (2003-2007). SMART ALPHA-VALVE. Smart parts No. A 0021401460. Modellreihe Smart Fortwo. Fahrzeugmarke Smart. Luft- & Kraftstoffversorgung Einspritzanlage.